I'm going to be pretty honest with you guys for a minute. Not that I'm not honest all the rest of the time, but you know what I mean. This week (*cough month) has been pretty terrible for me. A year ago my Father passed away very suddenly and the anniversary of that is coming up right quick. The entire year has been a struggle; for me, for my Mom and sister, for my own family. Every day is a challenge. This week, however, has been so utterly beyond trying. Maybe because it is the first anniversary of his passing, maybe because it is the spring and that was his favourite time of the year, or because while everyone else seems to think I should be "past" this, I'm still grieving (albeit privately) as much as I was when it happened. I don't know. So for those of you who are regular readers (and I love you all dearly, you mean so very much to me), you will have noticed that this week has had a lot more inspiration and encouragement cards, than usual. Perhaps I have been trying to pick myself up by creating these cards. So this challenge really moved me. You never know when the last time you see someone will really be the last time. Make it count. 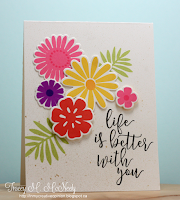 To create this card, I began by stamping the flowers from Lawn Fawn using Memento Tuxedo Black ink and colouring them with Copics. I then added the greeting (which makes me teary every time I read it) with Lawn Fawn Black Licorice ink, because it is wonderfully crisp. I used some warm grey markers (W1 and W0) to create a shadow on the lower side of the image. I trimmed the panel and extra 1/4" so I could add the glittery strip. All of this was adhered to a standard A2 sized card base. Gorgeous card, heartbreaking story. I am sorry for your loss and believe that everyone should be allowed to grieve on their own timeline, in their own way. Know that you have friends and family who support you. Thanks for joining us at Muse this week, Trina! Such a lovely card and colored so beautifully. Sorry for your loss. Trina, Thank you for your perspective, because you are so right. It's been a month of loss to our family as well and there is so much you wish you had written down, had said--even when you really TRIED. I think it's just the nature of things. Why is vision so much clearer in hindsight? Anyway, your card is lovely too and I am glad you can find a creative outlet. I know I work through a lot of things when my hands are busy.